6sqft has reported on the townhouse combo mega-mansion phenomenon before, such as when Roman Abramovich clashed with the DOB over a set of Upper East Side townhouses and when Sarah Jessica Parker and the unrelated but also loaded Sean Parker dropped a bundle on their respective two-and three-fers; now another stunning double scoop of insane townhouse living just hit the market at 166 East 81st Street and 179 East 80th Street (just down the street from Madonna’s triple Georgian townhouse compound). 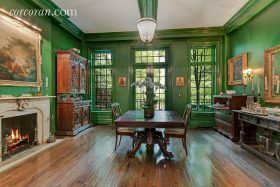 The two contiguous houses comprise 8,000 square feet of gorgeous 1899 historic details and uptown opulence for the appropriately uptown ask of $28 million. Unlike those other Siamese townhouse siblings, though, these bad boys are adjoined back-to-back through a private 74-foot two-tiered landscaped garden with a swimming pool. Take that, Madonna.